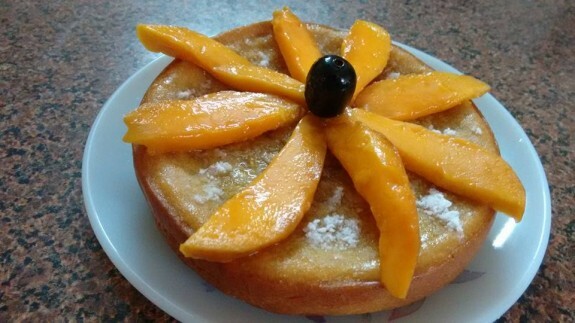 In Eggless Mango Cake, the sweetness of mango is just pop out with full of flavour. The sweetened condensed milk is working in this recipe as the replacement of eggs. I had used both melted butter and oil here to give a creamy moisture texture in the cake. To make flavourful cake, always use good quality mangoes like alphanso etc. You can also check our so many other flavaourful cake recipes. 1. Preheat the oven to 180 degree C for at least 10 minutes. 2. Now, grease a 9 inch cake pan with butter or oil. 3. Take all the dry ingredients like flour, baking soda and baking powder in a bowl. Whisk them all. 4. In another bowl, take melted butter, oil and mango pulp. Beat everything well so that everything mixed very well. 5. Add condensed milk on the butter mixture and again beat it. 6. Add the dry flour mixture and continuously beat it. Mix everything well so that any lumps will not form. 7. Pour the batter into the greased pan. 8. Bake it for 35-40 mins in the pre-heated oven. Insert a toothpick in the center of the cake to check whether it is comes out clean or not. 9. Let the cake cool into the pan for 10 mins. Now, spread sugar dust over the cake and garnish the cake with mango slices.